› Author Affiliations Funding This work was supported by National Institutes of Health and National Heart, Lung, and Blood Institute grant R18HL108788. 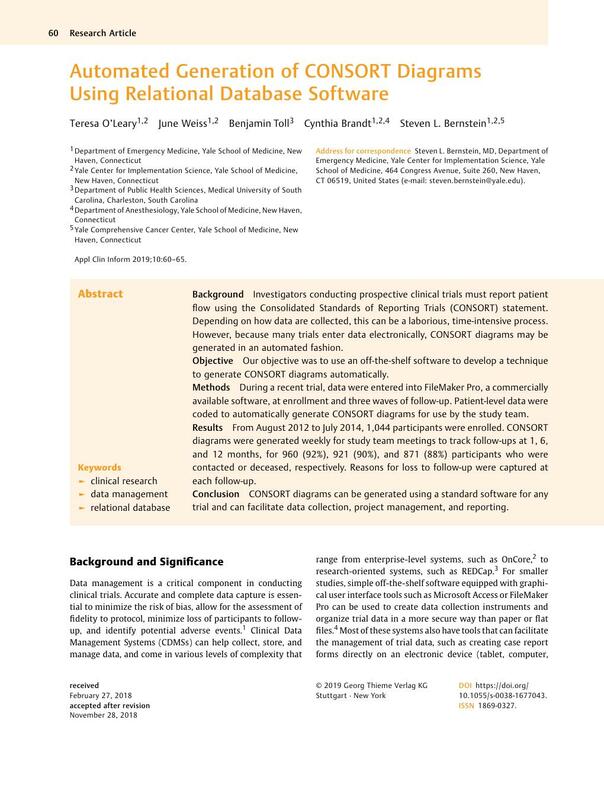 Background Investigators conducting prospective clinical trials must report patient flow using the Consolidated Standards of Reporting Trials (CONSORT) statement. Depending on how data are collected, this can be a laborious, time-intensive process. However, because many trials enter data electronically, CONSORT diagrams may be generated in an automated fashion. Objective Our objective was to use an off-the-shelf software to develop a technique to generate CONSORT diagrams automatically. Methods During a recent trial, data were entered into FileMaker Pro, a commercially available software, at enrollment and three waves of follow-up. Patient-level data were coded to automatically generate CONSORT diagrams for use by the study team. Results From August 2012 to July 2014, 1,044 participants were enrolled. CONSORT diagrams were generated weekly for study team meetings to track follow-ups at 1, 6, and 12 months, for 960 (92%), 921 (90%), and 871 (88%) participants who were contacted or deceased, respectively. Reasons for loss to follow-up were captured at each follow-up. Conclusion CONSORT diagrams can be generated using a standard software for any trial and can facilitate data collection, project management, and reporting. This study did not involve human or animal subjects. The parent trial from which this study was conducted was performed in compliance with the World Medical Association Declaration of Helsinki on Ethical Principles for Medical Research Involving Human Subjects and was reviewed by the Human Investigation Committee of Yale University.